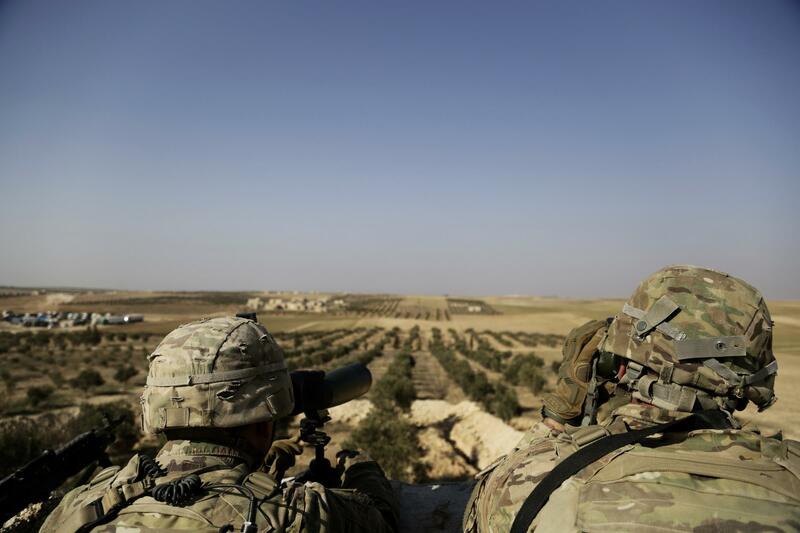 American troops look toward the border with Turkey from a small outpost near the town of Manbij, northern Syria, in February. The U.S. plans to withdraw all of its troops from Syria, a senior Pentagon official tells NPR. About 2,000 U.S. troops are currently in the northeastern part of the country, near the Turkish border. The decision to remove all troops from Syria was made by the White House late last week and sent to Secretary of Defense Jim Mattis, the official says. The Joint Chiefs of Staff held a meeting on Monday about the issue, and officials at U.S. Central Command will work on a timetable for the withdrawal. Officials are considering also reducing troops in Afghanistan. A State Department official says that department's staff members who have been working to stabilize the area — helping with water, electricity, schools and other basic needs — will be leaving Syria, and that it has advised U.S. citizens in the country to do the same. The official says their withdrawal was a White House decision. In a tweet Wednesday morning, President Trump did not mention the troop withdrawal, but seemed to refer to it obliquely. "We have defeated ISIS in Syria, my only reason for being there during the Trump Presidency," he wrote. On both Capitol Hill and in the Pentagon, the reports stirred confusion Wednesday morning as officials tried to understand who had ordered the withdrawal, NPR's Tom Bowman reports. U.S. troops have been in Syria since late 2015. The U.S. and its allies have largely been successful in their campaign to defeat ISIS and capture territory it claimed as its "caliphate." Pentagon officials have said that ISIS controls about 2 percent of what it once did in the Middle East. The Pentagon released a vaguely worded statement of its plans. "The Coalition has liberated the ISIS-held territory, but the campaign against ISIS is not over," said spokesperson Dana White. "We have started the process of returning U.S. troops home from Syria as we transition to the next phase of the campaign. For force protection and operational security reasons we will not provide further details. We will continue working with our partners and allies to defeat ISIS wherever it operates." "Five years ago, ISIS was a very powerful and dangerous force in the Middle East, and now the United States has defeated the territorial caliphate. These victories over ISIS in Syria do not signal the end of the Global Coalition or its campaign. We have started returning United States troops home as we transition to the next phase of this campaign. The United States and our allies stand ready to re-engage at all levels to defend American interests whenever necessary, and we will continue to work together to deny radical Islamist terrorists territory, funding, support, and any means of infiltrating our borders." The troop withdrawal is a reversal of policy discussed as recently as this month by Mattis, who said that after the defeat of ISIS, U.S. forces would remain in Syria to prevent a resurgence of the terrorist group and to counteract Iran. Northern Syria, where the U.S. troops are located, is under Kurdish control. The U.S. has been allied with the Kurds in the battle against ISIS but not in their fight against Assad. Trump and other U.S. officials have been critical of the Assad regime, but the U.S. has not made sustained efforts to topple his regime. With support from Russia, Assad and his backers have essentially won the war and now seek to extend their rule over the parts of the country they don't yet control. Turkey considers the Kurds to be a terrorist group and has troops posted in Syria along the Turkish border. With U.S. troops gone, Turkey would likely have free reign over the area. Trump recently spoke by phone with Turkish President Recep Tayyip Erdogan about Syria. On Twitter, Sen. Lindsey Graham, R-S.C., voiced his displeasure with a troop withdrawal plan. "Withdrawal of this small American force in Syria would be a huge Obama-like mistake," Graham tweeted. "With all due respect, ISIS is not defeated in Syria, Iraq, and after just returning from visiting there — certainly not Afghanistan. President @realDonaldTrump is right to want to contain Iranian expansion. However, withdrawal of our forces in Syria mightily undercuts that effort and put our allies, the Kurds at risk." Mona Yacoubian, senior adviser on Syria at the U.S. Institute of Peace, says the U.S. withdrawal comes as a surprise with significant consequences – including a likely end to any alliance with the Kurds. "It will have, I think, enormous negative ramifications for U.S. security interests in Syria," she tells NPR's Michele Kelemen. "And I think it stems from the battle to defeat ISIS in some enduring way. We're not there yet, and I think we need to hearken back to Iraq and learn those lessons." "But also efforts by civilians on the ground to stabilize those parts of Syria that have been liberated from ISIS — those operations will also have to stop without a U.S. military presence on the ground protecting them," she says.